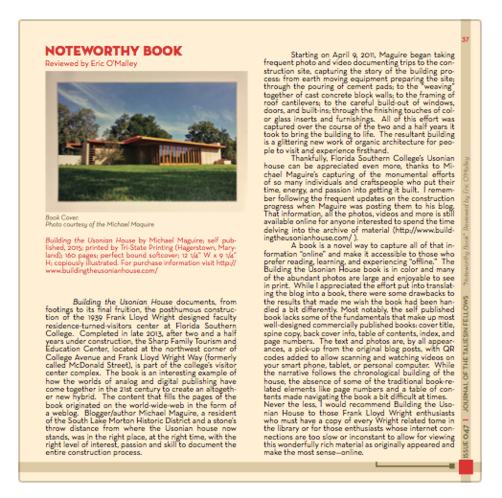 The current issue of The Journal of the Taliesin Fellows features a comprehensive look at "organic architecture in Florida" and includes photos of the Florida Southern College campus, an article by Jeff Baker, who was the supervising architect for the Usonian house and is leading the restoration work currently underway on the original buildings, and a cheerful review of the book produced from this blog. Click on the image above ( or right here ) for a PDF version of the review. Select from the links below to view one volume of the chronicle as it might appear in hardcover form later this year. 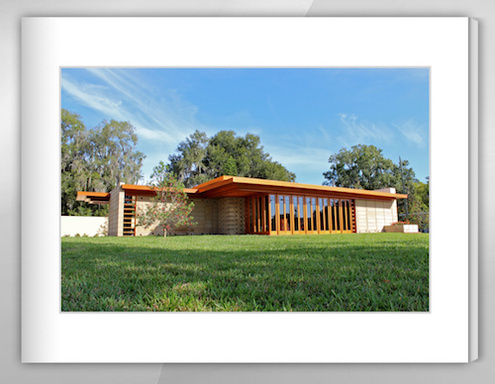 The house we are constructing was specifically designed for Florida Southern College in 1938. 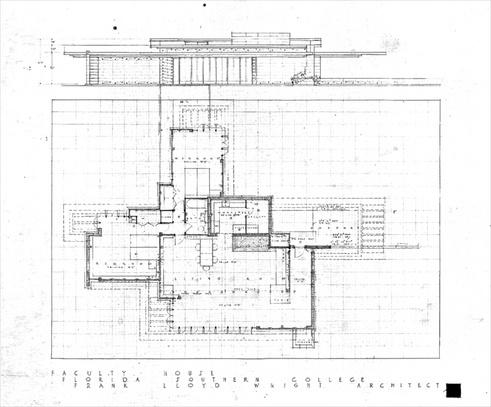 However, after this house was designed, Wright used the unrealized plan for another Usonian house called the Hause House (1942), intended for Lansing MI. This project was designed in wood, not block, and modifications were made to that plan such as a balcony because that house was situated on a hillside. 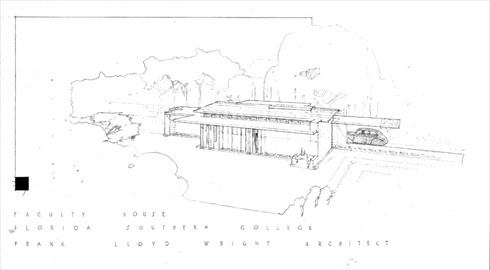 However, the plans for that house were helpful for us because they were brought up through working drawings and provided information on Wright’s intent for this plan in terms of some spacial characteristics. The Hause House was also never constructed. The information we have is that Wright was told that the college would need about 20 houses for faculty members. Wright laid out a rough general site plan situating 14 of the houses just to the east of the present day Wright-designed campus (along Columbia Way), between South Ingraham and Harvard Road), however there does not appear to be an attempt to specifically situate this particular house on one of those sites because the project did not progress that far. Because the college was applying for FHA loans to construct these houses, only one was more fully developed, with a site plan, floor plan, elevations and a rendering, for the purpose of obtaining approval from the bank for the loan. While the site plan is believed to have been somewhere alongColumbia Way, there are no drawings specifically linking the specific site plan to the general site plan. In any event, the specific site plan clearly illustrates the situation of the house on the plan, including which direction the house was to face. Fortunately, our new site plan a few blocks away is nearly identical to that drawn by Wright in terms of size and orientation. Therefore, the plan of the house is accurately situated in the north/south direction, and its relationship to the street to the east is also accurate. This was understood to be a basic requirement of the project because Wright designed his houses with orientation in mind. 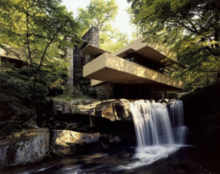 Frank Lloyd Wright’s America – Or Is It Usonia? About 30 Usonian houses were built in America, er, Usonia. Visitors of the Currier Museum of Art in Manchester, New Hampshire may take a tour of the Zimmerman House, designed in 1950 by Wright for Dr. Isadore and Lucille Zimmerman. Wright designed the house, the interiors, all the furniture, the gardens, and even the mailbox. (The Zimmermans had a pretty nice collection of modern art, too, which is also on view in the house.) 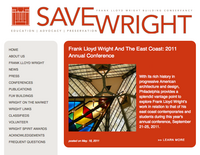 It is the only Wright home open to the public in New England. Click here for the original story in "2paragraphs"
Lakeland-based EarthLinked Technologies designed and installed the geo-thermal system that will heat and cool the house. CEO Hal Roberts describes the process. See the site videos from last July, when the first half of the field was laid, and March, when the second stage was completed. Learn more about the technology here. by Everett E Henderson, Jr.
We discovered it in a Google search for Usonian House. Click here (or there) to download the PDF version. Wright's book, The Natural House, is available at Amazon. 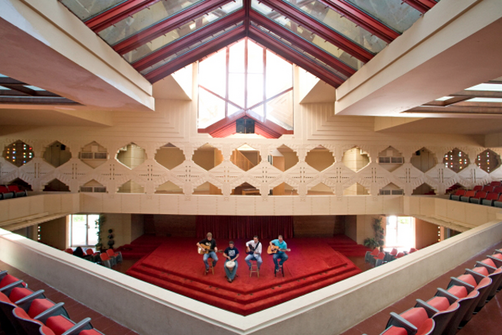 In April 2009, World Monuments Fund was honored to convene a historic gathering of historians, architects, conservators, craftsmen, and scientists at Florida Southern College to explore Frank Lloyd Wright’s use of ornamental concrete textile block construction. To Wright, this material was a highly expressive, decorative, and practical approach to create monumental yet affordable buildings. Indeed, some of his most iconic structures, including the Ennis House in Los Angeles, utilized the textile block system. However, like so many of Wright’s experiments with materials and engineering, textile block has posed major challenges to generations of building owners, architects, and conservators who have struggled with the system’s material and structural performance. Click here for the story by Robin Hill on Buildipedia.com. 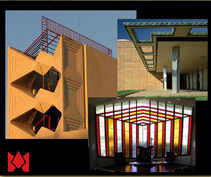 describes a series of documentary films, each on a different theme of structures from Frank Lloyd Wright's career, and inlcudes a screening and lectures schedule, as well as clips from the productions.